Deck the Halls – and the Rest of the House! Perhaps the most celebrated holiday around the world, Christmas is a time for traditions, family get-togethers, caroling, sleigh rides, gift-giving, and much more. It’s also a time for bright, flickering lights around the house, wreaths, mistletoe, a crèche under the tree, and classic Christmas decorations and symbols. When Christmas comes around each year – before the first frost even sets in - families unwrap boxes of traditional and modern ornaments and dig up their favorite arts and crafts projects. Then, the decorating begins in earnest. Whether you prefer the simple and elegant or the elaborate and dramatic, you can give your home a special festive flair and make it especially cheery at Christmas time. 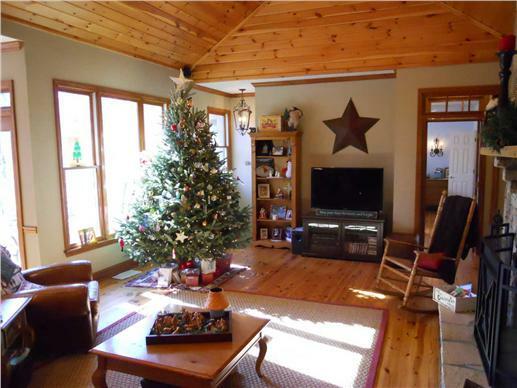 There’s just nothing like a home filled with Christmas spirit – and decorations! But, where do you start? What if you’re looking to do something a bit different this year? From the courtyard to the kitchen, here are some ideas to think about for the ideal holiday house. 1. 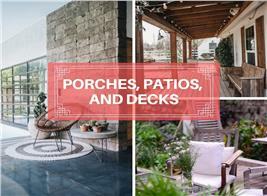 Start with the Front Yard / Front Porch Décor. This is what everyone sees first. So, let’s make friends from near and far feel welcome. Christmas wreaths, garlands, and lights on windows, doors, and the front porch are the most classic adornments for home exteriors. Position tea lights under the wreaths and string multi-color Christmas lights around the house to give it a dramatic effect at night. In addition to the usual symbols of Christmas – Santa Claus, snowmen, reindeer, sleighs – families also set up religious displays like crèches and angels. We suggest doing these decorations with young children as it makes for a fun family project and allows everyone to participate. Christmas wreaths on the windows and front door and mini trees wrapped in red ribbon adorn a classic Colonial home (left) (Plan 170-2549). 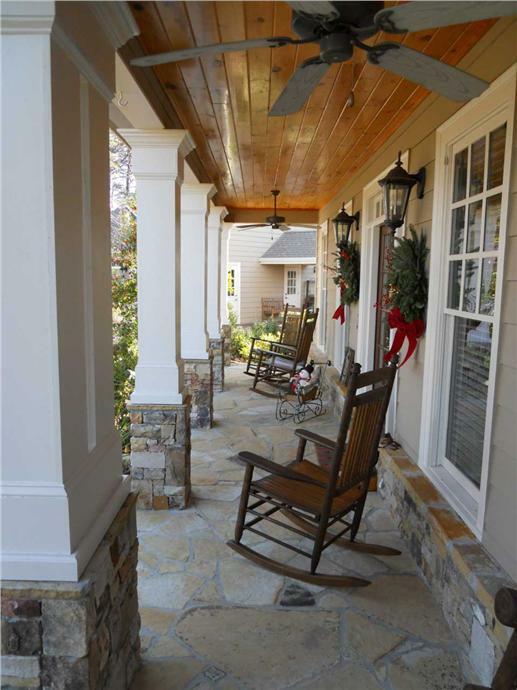 Wreaths and a snow sleigh are the simple adornments on the front porch of the rustic mountain home on the right. (Plan 163-1020). Hang garlands around the front door, add outdoor lights and traditional Christmas symbols, and you get a dramatic Christmas picture (as in the home above). 2. A Welcoming Foyer. 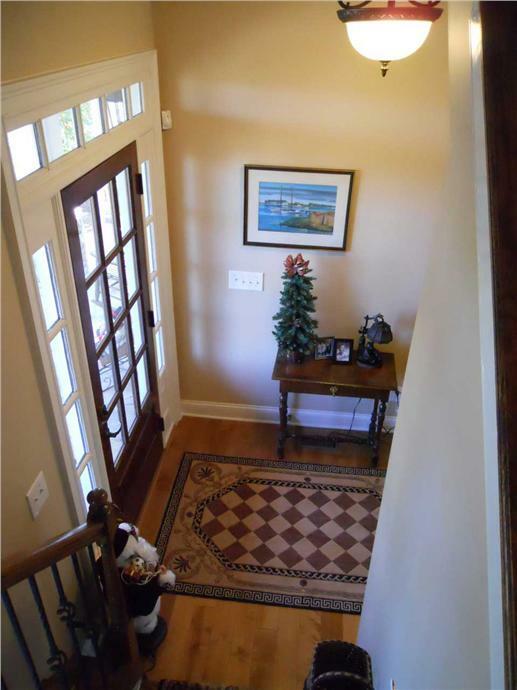 It’s an inviting sight to have a decorated foyer – it can be as simple as a mini Christmas tree on a table, poinsettias, or other Christmas flower displays along the hallway. Touches of Christmas décor – a small tree on a table, area rug in Christmas colors and Santa – make this foyer a welcome sight as guests open the door. (Plan 163-1020) A variation of the décor is on the right – a crimson bow on the base and tree twigs with ornaments. 3. Staircase with Two-Story Entry. If your staircase is in full view when people walk into your home, take advantage of this! Be sure to deck it with garlands and Christmas wreaths. You can tie seasonal ribbons or hang pinecones and other ornaments to enhance the festive feel. 4. 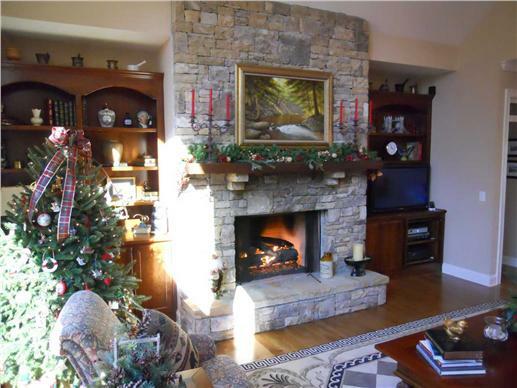 The Stockings Were Hung… Fireplace / Mantel. 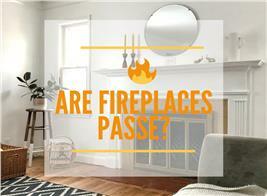 You can be as creative or traditional with fireplace/mantel decorations. Most families hang stockings and lights around the mantel. If you want the calming scent of Christmas, top the mantel with fresh holly sprigs, pine tree boughs and flowers. Candelabras or candles of varying heights are basic features on mantels. They add warmth and a dramatic mood to the Great Room or family room.Potted flowers at the base of the fireplace provide color. How about a Gingerbread house display and a Christmas drum for effect? 5. 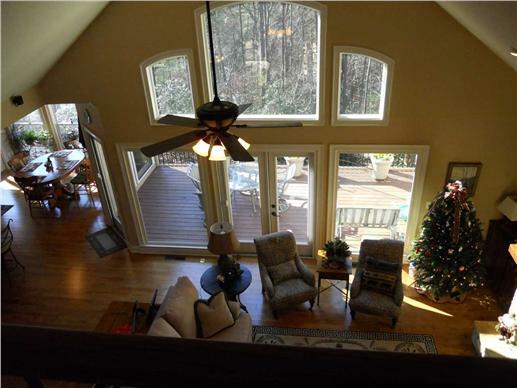 In the Heart of the Home… Great Room / Family Room. 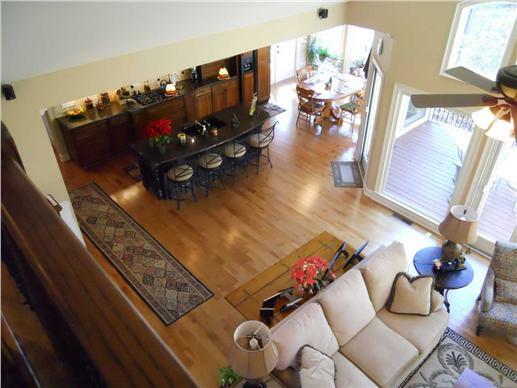 For some families, the main gathering area during the holidays is the great room or family room. If you have high ceilings, this room will accommodate a more dramatic floor-to-ceiling Christmas tree or stacked Christmas wreaths. Even with more modest ceilings, red and green pillows/cushions and sofa throws in a mix-and-match of Christmas colors (gold, silver, red, and green) can liven up the room with a Christmas spirit. People love candles and Christmas tea lights on their coffee and end tables. 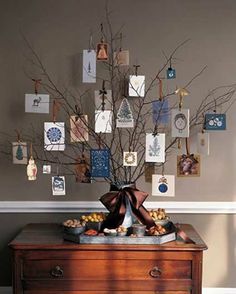 Add a little flair by scattering ornaments or berry/holly sprigs around the candles. You can also fill vases with Christmas balls. 6. Cooking this Christmas? 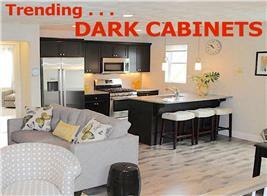 Brighten Up that Kitchen and Kitchen Island. The kitchen is the center of almost all holiday activities – and Christmas is no exception. In most homes today with open floor plans, the kitchen flows seamlessly into the gathering areas – making it convenient for everyone to interact with each other. You can create a festive mood in the kitchen/breakfast nook with simple flower arrangements on the table; garlands on windows, and wreaths with ornaments hanging from the ceiling. 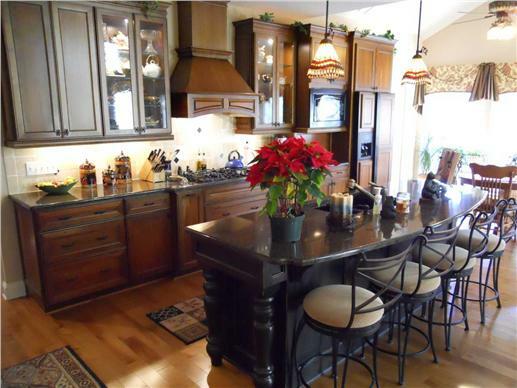 The kitchen area of this country home features a potted poinsettia and candles on the snack bar and pine boughs scattered atop the cabinets. More photos of this home are below. 7. The Christmas Tree! What’s Christmas without a Christmas tree? Large or small, real or artificial, simple or elaborate, a Christmas tree – with its pine-y scent and ornaments - completes the Christmas image. 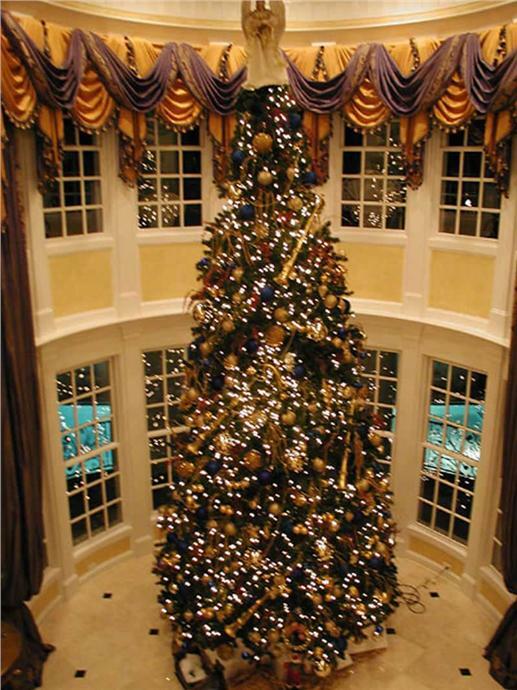 A Christmas tree in a palatial colonial home (left) (Plan 106-1206), and one in a more rustic county home (right) (Plan 163-1025) both fill the home with Christmas cheer. 8. Down through the Chimney... Now that the home is ready for Santa Claus, make sure that chimney is clean. 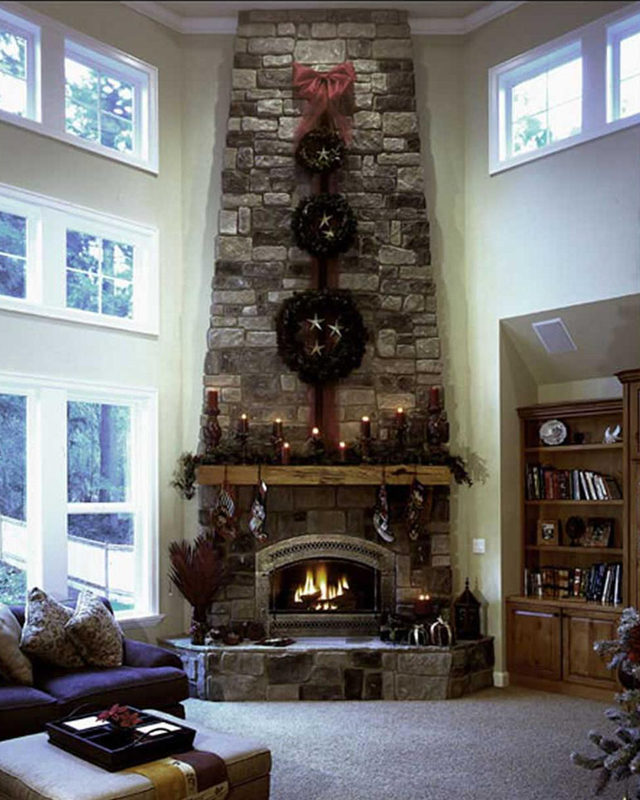 You may want to light your first fire in the fireplace for the season before Christmas Eve or Day – if anything is wrong with the chimney or flue, you don’t want to be working on it during the holiday. Prepare the cookies, carrots, and milk; sprinkle the pixie dust; light your home for Santa and his reindeer! 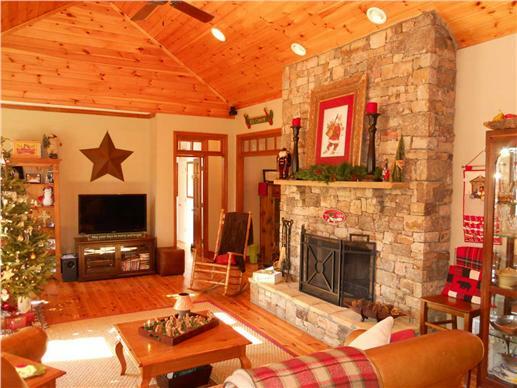 Here’s a home with a chimney ready to “host” Santa and his reindeer. Light up the tree and scatter tea lights on the snowy ground to welcome him (Plan 157-1619). 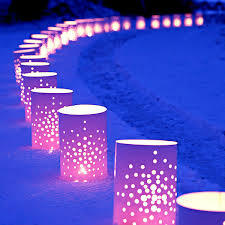 Take a tip from Halloween and use luminaries (left) to light a path in the snow and lead Santa to your home/chimney. It’s time to get caught up in the Christmas spirit… and renew and relive all the beautiful traditions of this holiday! 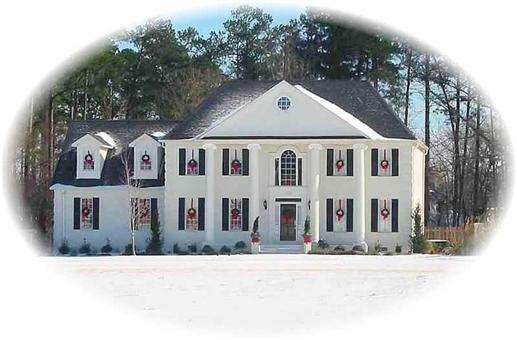 Footnote: The lead image is of this Southern style country home, Plan #170-1343. To view more, click here.